So little by little I continue a trouser project here. It will take quite a while as I have to develop a suitable production in hand making. I just publish impressions, there will be not much explanations, just watch and see. Edited by Der Zuschneider, 19 November 2010 - 11:56 PM. There must be a giant among use! Did anybody else see the size of that thimble?! He mustn't be from Germany, either. Some of those sticks look like throw sticks and maybe boomerangs. Clearly he must be from Australia. Looking good Der Zuschneider. Glad to see you finally getting to work. Moving and setting up in a different country with a different language can't be easy. Like your furniture. Nice set up, good luck in your new venture. Love how you print everything (in Fractur), instead of handwriting. Looks very nice and clean. It's the width of the dart that surprised me, not the length. But if you draft net, without seams, then it's normal, nothing to say. And my comment about the stamps was not laughing at you. I actually like this idea, it makes things very neat. I like that. Maybe I'll get some done for me too (but not in fractur, it's too hard for me to read this). Plus it looks good for customers. It's good marketing. DZ - how fantastic! I love the stamps, I would love to do that myself one day if anyone was likely to see my patterns, or I had money to burn. 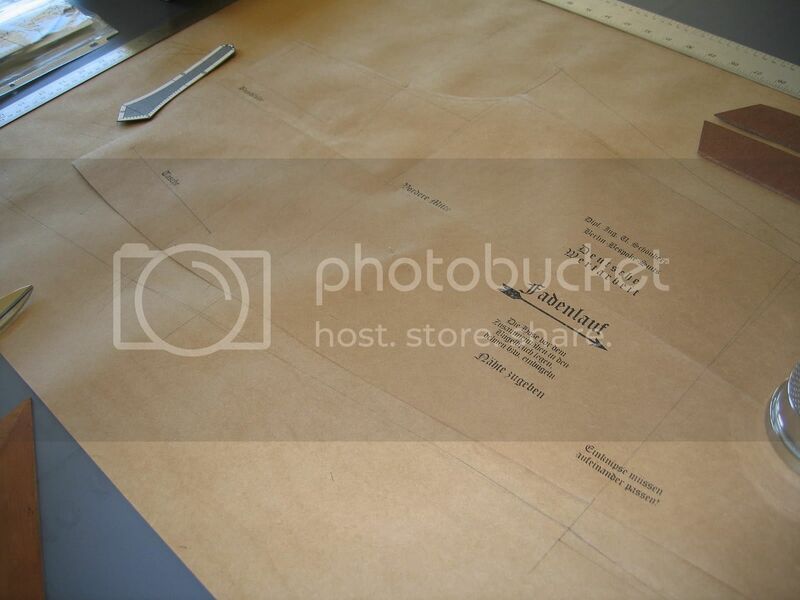 I'm very impressed with your set up - I like a good template too and learned that from a German tailor. Let me know if you need someone to relieve you of any of those hams! the stripes of the two layers of the fabric have to be fixed on top of each other with needles to match the stripes on both legs evenly. Since I draft without seams I can evenly add inlays or seams. There is no need to fiddle with the basting thread unless a few spots. Edited by Der Zuschneider, 20 November 2010 - 07:27 AM. The customers must be impressed seeing his personal pattern with info stamped on it. Do you stamp the date on them? It's the first time I see a tailor pin his pattern to the cloth... Interesting. I studied in TFH-Berlin, the diplom is more than a master, but in the USA it is only a Bachelor, cause the Americans waste their time to learn reading and writing in university before they get to the topic, therefor the German degree counts nothing to less in the United States. When you hold your degree in Maschinenbau you have no problem finding work in Germany. I holf my degree in Bauingenieurwesen, was complete useless, no jobs since 1996. This is how Merkel is wasting German resources for a state with 1 Euro workers. I am not the only one that run away from Germany with degree. Only pregnant women, Harz 4, and elderly remain in Germany. When you working on cloth with stripe design make sure all stripe lay on top of each other, you have to pin the complete cloth every 20cm in all directions looking that the needle hit the same stripe on top and underneath. Da muss man bischen fummeln bis man das hinbekommt und es dauert eine Weile. The pattern can also be pinned on the fabric so it is easier to chalc and to move the whole thing around from table to table. Don't think about making stamps like me, that can cost you 600$. I just have made them cause I was used to have them in the Zuschneideschule Berlin. Those stamps are only for ultimate tailors who know what they do. Everybody saw my stamp "Deutsche Wertarbeit"? This is how it goes, traditional working. Der Stempelmacher hat in mit besonderer Liebe fuer mich hergestellt. Edited by Der Zuschneider, 21 November 2010 - 04:47 AM. How do you proceed for checks ? I found pinning fastidious and not that reliable, so I cut in two times, first one side, then I precisely match the cut panel with the cloth and cut the other side. I've discussed with several tailors, who told me they do the same. i find this takes time, and requires great precision on the shears (but then, cutting always need precision with the shears). If you use oaktag (aka manila paper), you can't pin it. But if you're an ultimate tailor knowing what he's doing, you can use pattern weigths, and oaktag makes it easier to chalk. Moving cloth + pattern from table to table seems not such a good idea to me, even with the pattern pinned. Why do you need to do this ? Don't think about making stamps like me, that can cost you 600$. I already estimated the cost, and decided you have more money than I have. I like the idea, it's very neat, and stamping is always fun, but it's too expensive. I'd rather buy me some tools, or train ticket to visit the mills in Yorkshire. Being an engineer myself, I was thinking about good old-style normographs (things that young people today may not know, but I've learned old-fashioned technical drawing, with Rötring pen, ink and normographs). I need to clean my Rötring pens set, I'm sure I'll love putting it into service again. This will make nice, clean patterns. 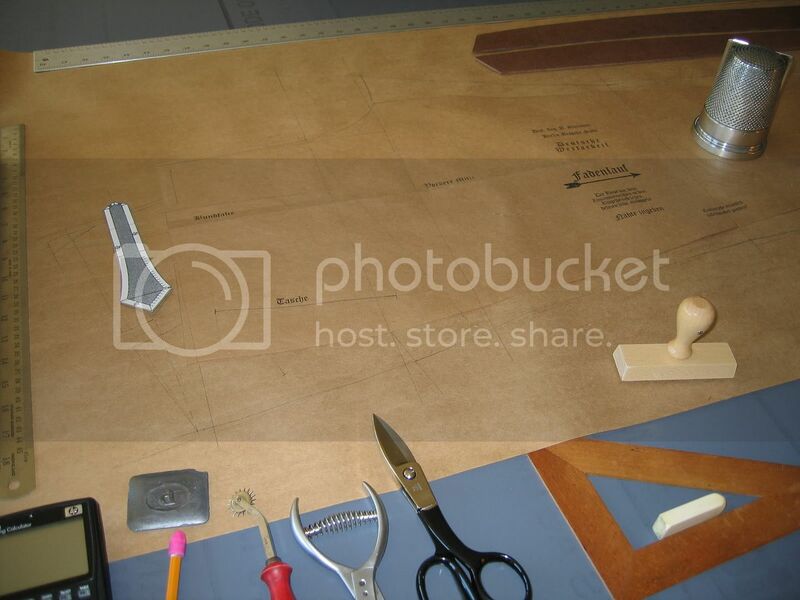 I'll have to see with a woodworker how to give the correct edge to my rulers (I use my old technical drawing squares, which are ready for ink, but tailor's hip sticks are just plain wood). Zuschneider, I'm not sure how informed you are about the going on's in the German higher education system, but Germany is a signatory of the Bologna Treaty. The Diplom is history. It no longer exists. In Germany one can only do Bachelors and Masters as of about 3 years ago. Mir ist das ein Schritt zurueck. I studied at the TU Ilmenau in Thueringen. A whole bunch of guys from the old VEB Carl Zeiss Jena taught me. Diplom is history in Germany, I know, and the BS is somthing you can whipe the floor with today. But the Diplom stands educationaly higer than a master. So if you have a Diploma your are good. Es ist ein Schritt zureuck, wie du schon sagst. But now bck to the pants. You have to decide pining through or cutting separate. I pin through whatever it takes, cause I like equal seams on a mm. Cutting takes lots of times like everythign else. I needed to take pictures so I had the parts moving around, otherwise I just put some wights on top of the pattern. I moved the parts around after they were cut out to take the pictures. Don't know what oaktag is. Tailors used since 100 years the paper you see in my pictures or drafted directly on cloth. I made "hundreds" of Rotring Skripent drafts in A3 to study cutting systems. I still have my rotring set here nicely cleaned. But there is no need for me anymore to continue making A3. I have everything in the books and there is nothing I have to investigate anymore. I concentrate on producing now. To make 1:1 patterns in ink is nonsense unless you will hang it on the wall like a picture.